Antrorse Technosoft Pvt. Ltd. is a software development company, provides Ads & Marketing solutions with more then 32 software products and services. Antrorse Impex Pvt. Ltd. helps manufacturers and trading firms interested in export of consumer products worldwide and also assisting them in importing goods. Antrorse Foundation is a non-profit making organisation supporting men, women and children for their upliftment, betterment and education. Working in the field of consultancy and placement with deep focus on market research, marketing strategy and sales from 2004 we decided to come up with a brand called “ANTRORSE” and registered our company our first business name as ANTRORSE IMPEX PRIVATE LIMITED in the year 2011. We further expanded our business in the field of software development and research in 2012 with the trade name ANTRORSE TECHNOSOFT PRIVATE LIMITED. We will now be expanding our business in the field of Construction, Finance, Advertising, Entertainment, Sports and hospitality in near future. We combined called it as “ANTRORSE CORPORATION”. Antrorse Corporation was established in the year 2011 with trade name Antrorse Impex Private Limited with a vision to establish itself as a leading importer of construction materials from all over the world. Later on we expanded our business in software sector as Antrorse Technosoft Private Limited in the year 2012. 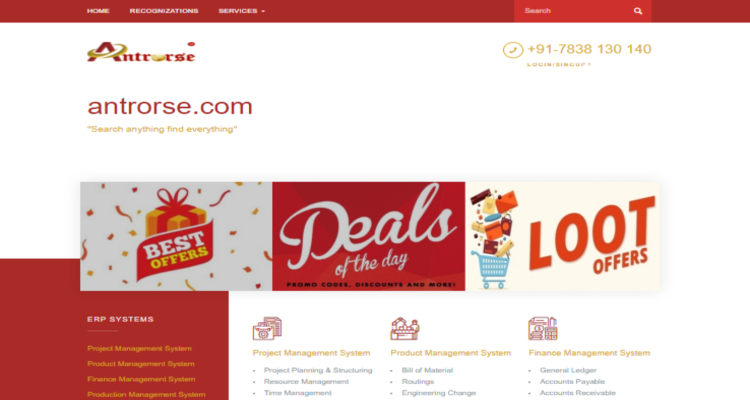 Antrorse Techno soft Private Limited presents www.antrorse.com with a view to bring all your requirements under one roof. Search all your requirements like properties, travel, matrimonial, health, career, food, entertainment, education, books and also explore your personal and professional network and experience the difference. With a single log in id you can manage all your accounts and needs. You get contacted when you want and how you want assuring your privacy with us. With antrorse mobile app you can experience the ease of simplicity and technology. Different from all other on line sites present today we assure you the quality of all products you buy through us. We personally check the quality and durability of all products and services we maintain to assure best quality to all our customers with dedicated 24*7*365 customer support to solve all your issues within minimum timeframe . Welcome you to the world of trust, quality, durability and satisfaction. Antrorse Technosoft Private Limited is a CMMI Maturity Level 4 and ISO/IEC 27001:2013 certified company committed to provide reliable and cost effective IT Solutions to organizations globally. Company has the customer’s needs as is core and ERP as a core competence. Antrorse has been providing high quality services for software development .We ensure that our solutions have a direct and measurable impact on your organization's competitiveness. Antrorse Impex Private Limited was formed in 2011 with its head office located in Bangalore. The company helps manufacturers and trading firms interested in export of consumer products worldwide and also assisting them in importing goods. Main activities undertaken by the company under international export include import/export services worldwide including shipping, warehousing and delivery of agricultural, architectural and construction products. Antrorse Foundation is a non-profit making organisation we work individuals on our Community Impact Programmes. supporting men, women and children for their health, education, income stability and culture as the cornerstones to the wellbeing of individuals and stronger communities. 2018 Antrorse Corporation © All Right Reserved.